This 'Short Version' is a brief summary of everything that follows in this web page; an explanation of the final 70th Week of the 70-Weeks prophecy of Daniel 9:24-27. In that prophecy God gave the world two timetables; a 69-week timetable leading up to the first coming of Jesus Christ, and a remaining 70th week leading up to His second coming. The 69-week timetable consisted of 69 'weeks' of years, each week lasting for 7 years (for a total of 483 years). Jesus fulfilled that timetable when He entered Jerusalem on Palm Sunday, four days before His crucifixion. The first two pages in the prophecy section of this web site (An Introduction to Prophecy and The Olivet Discourse explain the first three links. This page focuses upon the final link in this chain; John's Little Book. To put it simply, in the gospels of Matthew, Mark and Luke Jesus has told us (in His 'Olivet Discourse') that the midpoint of the 70th Week is the destruction of Jerusalem by the Romans in 70 AD. Then, in the book of Revelation, God has given us four visions of the entire 70th Week (in John's Little Book). John received the Little Book in Revelation chapter 10, and has set its contents before us in Revelation chapters 11-13. When we combine the Olivet Discourse with John's four visions, the nature of the 70th Week becomes obvious. The second vision, of 'The Two Witnesses' (Revelation 11:3-12), describes God's giving of the entire Bible ('the Law and the Prophets') to the world during the first half of the week, and then portrays the dead bodies of God's servants lying in the city of Jerusalem throughout the second half of the week. This is a picture of the guilt of Israel that Jesus warned about in Matthew 23:34-36; for their persecution of God's prophets during Old Testament times, their crucifixion of Christ, their persecution of Christ's disciples after His resurrection, and their opposition to the proclamation of the gospel to the world. This perspective on the 70th Week of Daniel is based upon the simple and obvious meaning of God's word. With it we can see that God has explained world history to us in a very accurate and useful way. And He has shown us that we are now living very late in the second half of the 70th Week. It is this perspective on the 70th Week that is the foundation for everything else that I have to say about prophecy in this web site. Without a willingness to at least consider my explanation of Daniel's 70th Week, any further time that my visitor might spend in the prophecy section of this web site will be of little use. Revelation 10 describes the apostle John's reception of a 'Little Book'. He was told to eat it. It was sweet in his mouth, but bitter in his stomach. Then John was told that he must prophecy 'again'; in other words, give an additional prophecy, above and beyond what he had already received. The 'Little Book' contained that additional prophecy, and its contents are revealed to us in Revelation 11-13. John's Little Book sits in the larger book of Revelation, much like the little advertising or other 'special inserts' that we find in magazines like Time or National Geographic. It is held in place, and connected to the rest of Revelation, by the 'staple' of the 7th Trumpet (Revelation 11:15-19). John's Little Book provides us with 4 visions of Daniel's 70th week. Each vision describes that Week in terms of one or both of its halves. In this vision John is told to measure the Temple and the Jewish people who worship there, but to leave out the court (the Temple Mount), because it will be given to the Gentiles for 42 months (42 months is 1/2 of 7 years). 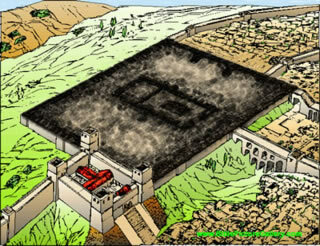 The measuring of the Temple, altar and Jewish people may represent God's judgment upon them. We see judgment depicted as a measurement in the downfall of King Belshazzar (he was weighed and found wanting, Daniel 5:27), and in Jesus' warning that we will be measured with the same measure that we apply to others (Matthew 7:2). Having been completely fulfilled by the death of Christ, the animal sacrifices of the Old Mosaic Covenant no longer had any purpose. In fact, their continued offering by Israel's priests represented a denial that the Messiah had already come. 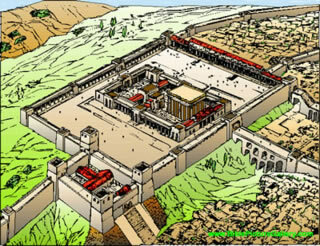 The Temple was destroyed and the Jewish people were driven from Jerusalem in 70 AD. The Temple was burned by the Romans, and then the debris was removed. The 'court' has been trampled by the Gentiles ever since. This suggests that John's '42 months', and the past 1940+ years, may actually be the same period of time. In other words, the 70th Week is not a period of 7 literal years. 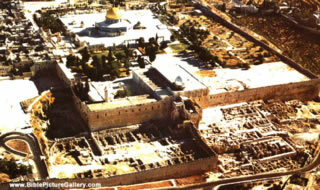 THE TEMPLE MOUNT TODAY, OCCUPIED BY TWO MUSLIM MOSQUES. IT IS STILL TRAMPLED UNDERFOOT BY GENTILES, '42 MONTHS' LATER. This vision is one of 3 passages within the book of Revelation (the others being Revelation 3:9 and 17:10), which suggest that the book of Revelation was written before the fall of Jerusalem. If John had received the Little Book after the fall of Jerusalem, there would not have been a Temple, altar or people for him to measure. As it is, there is not a single indication in Revelation that Jerusalem had already fallen when John wrote it. These two witnesses perform the same miracles that Moses and Elijah performed, but they are not Moses and Elijah. These witnesses symbolize the name that the Jewish people gave to the Bible; "The Law and the Prophets". This is a vision of God giving the Bible (both the Old and New Testaments) to the world; an activity which was authenticated by God through supernatural power and divine miracles performed by prophets and apostles alike. It ended just before the destruction of Jerusalem in 70 AD. And I will give power unto My two witnesses, and they shall prophesy a thousand two hundred and sixty days, clothed in sackcloth. These are the two olive trees, and the two candlesticks standing before the God of the earth. And if any man will hurt them, fire proceeds out of their mouth, and devours their enemies: and if any man will hurt them, he must in this manner be killed. These have power to shut heaven, that it rain not in the days of their prophecy: and have power over waters to turn them to blood, and to smite the earth with all plagues, as often as they will. And when they shall have finished their testimony, the beast that ascends out of the bottomless pit shall make war against them, and shall overcome them, and kill them. And their dead bodies shall lie in the street of the great city, which spiritually is called Sodom and Egypt, where also our Lord was crucified (Jerusalem). And they of the people and kindreds and tongues and nations shall see their dead bodies three days and an half, and shall not suffer their dead bodies to be put in graves. And they that dwell upon the earth shall rejoice over them, and make merry, and shall send gifts one to another; because these two prophets tormented them that dwelt on the earth. And after three days and an half the Spirit of life from God entered into them, and they stood upon their feet; and great fear fell upon them which saw them. And they heard a great voice from heaven saying unto them "Come up here". And they ascended up to heaven in a cloud; and their enemies beheld them. And the same hour was there a great earthquake, and the tenth part of the city fell, and in the earthquake were slain of men seven thousand: and the remnant were frightened, and gave glory to the God of heaven. Then answered Peter and said unto Jesus "Lord, it is good for us to be here: if You will, let us make here three tabernacles; one for You, and one for Moses, and one for Elijah". While he yet spoke, behold, a bright cloud overshadowed them: and behold a voice out of the cloud, which said "This is my beloved Son, in whom I am well pleased; hear Him". Here the Lord Jesus was not only associated with 'the Law and the Prophets', but given preeminence over them, since Moses and Elijah were servants of God, while Jesus was identified by the Father as His Son (Hebrews 3:1-6). Therefore, behold, I send unto you prophets, and wise men, and scribes: and some of them you shall kill and crucify; and some of them shall you scourge in your synagogues, and persecute them from city to city; that upon you may come all the righteous blood shed upon the earth, from the blood of righteous Abel unto the blood of Zacharias son of Barachias, whom you slew between the Temple and the altar. There should be no doubt that the many sufferings of the Jewish people, from 70 AD up to the present time, represent the fulfillment of Jesus' words. Again we are talking about a period of time much longer than half of 7 years. In this vision God describes the first half of the 70th week as a period of 1260 days (3.5 years), while twice He describes the second half as lasting 3.5 days. Here God is clearly indicating that the 70th Week is not to be understood as seven literal years. This trumpet is a continuation of the trumpets of Revelation chapters 8 and 9. John's Little Book sits inside the larger book of Revelation, much like the 'inserts' that are often found in the center of today's magazines. These often contain a special informational or advertising supplement that is added to the magazine, and can be removed and read separately. The 7th Trumpet is the 'staple' that attaches John's Little Book to the rest of the book of Revelation. And the seventh angel sounded, and there were great voices in heaven, saying "The kingdoms of this world are become the kingdoms of our Lord, and of his Christ; and He shall reign for ever and ever. And the four and twenty elders, which sat before God on their seats, fell upon their faces, and worshipped God, saying "We give You thanks, O Lord God Almighty, which are, and were, and are to come; because You have taken your great power and have reigned. And the nations were angry, and Your wrath is come, and the time of the dead, that they should be judged, and that You should give reward unto Your servants the prophets, and to the saints, and them that fear Your name, small and great; and should destroy them which destroy the earth. And the Temple of God was opened in heaven, and there was seen in His temple the ark of His testament: and there were lightnings, and voices, and thunderings, and an earthquake, and great hail. The 7th Trumpet's placement here (at the resurrection of the Two Witnesses) is appropriate, because it dovetails perfectly with the promised bodily resurrection of all of God's 'faithful witnesses' at the sounding of the last Trumpet, as foretold by Paul (1 Corinthians 15:52, 1 Thessalonians 4:16). The woman in this vision is the nation of Israel, struggling down through the centuries to successfully bring Abraham's promised Seed into the world. The Child is born and Satan tries to devour Him. This may represent Herod's attempt to kill the Christ-child at His birth, or it may represent Satan's frequent temptations of the Lord Jesus, to keep Him from succeeding in His work of salvation. The flight of the woman into the wilderness represents the dispersion of the Jewish people throughout the world, beginning with the fall of Jerusalem in 70 AD. And there appeared a great wonder in heaven; a woman clothed with the sun, and the moon under her feet, and upon her head a crown of twelve stars. And she being with child cried out, travailing in birth and pained to be delivered. And there appeared another wonder in heaven: Behold, a great red dragon having seven heads and ten horns, and seven crowns upon his heads. And his tail drew the third part of the stars of heaven, and did cast them to the earth. And the dragon stood before the woman who was ready to deliver, to devour her child as soon as it was born. And she brought forth a man child, who was to rule all nations with a rod of iron; and her child was caught up unto God, and to His throne. And the woman fled into the wilderness, where she has a place prepared by God, that they should feed her there a thousand two hundred and sixty days. Not only is the destruction of Jerusalem a judgment from God upon Israel; it is, at the same time, the means of Israel's deliverance. This vision tells us that, if the Jewish people had not been dispersed throughout the world for the second half of the 70th Week (1260 days), they might not have survived as a nation. The sun, moon and 12 stars are a reminder to us of Joseph's dream (Genesis 37:9-10). Joseph is symbolic of the Lord Jesus. Both men were betrayed into the hands of the Gentiles by their Jewish brothers. Both men were thought by their brothers to be dead. Jesus is now working behind the scenes, as Joseph did, to bring His brethren to repentance. Someday this greater 'Joseph' is going to reveal Himself to His people in a tearful reunion that will save their nation and bring them into everlasting blessing (Zechariah 12:6-13:1). As I see it, this vision presents a problem for the Dispensationalists. How do they incorporate Israel's giving birth to the Messiah, and His subsequent resurrection, into their future 70th Week? The woman flees into the wilderness after her child's resurrection, and is fed there for one half of the 70th week (1260 days). Which half of their 70th Week is this? This passage presents to us one of the most powerful lessons in all of the Bible. First of all it explains Satan's work as mankind's accuser. Until Jesus had accomplished our salvation on the cross, Satan had always been able to come to the Father and point out how undeserving we are of His mercy. I believe that, as Jesus hung upon the cross being tormented by His enemies, Satan was shouting in the Father's ear, asking 'How could you let your Son die for such wicked people as these?'. His accusations were valid and had merit. But once the Father forsook His Son, abandoning Him to death, our salvation was accomplished and mercy triumphed over judgment. Satan had no more business before the throne of God. And there was war in heaven: Michael and his angels fought against the dragon; and the dragon and his angels fought, and prevailed not; neither was their place found any more in heaven. And the great dragon was cast out, that old serpent, called the Devil, and Satan, which deceives the whole world: he was cast out into the earth, and his angels were cast out with him. And I heard a loud voice saying in heaven "Now is come salvation, and strength, and the kingdom of our God, and the power of his Christ: for the accuser of our brethren is cast down, which accused them before our God day and night. And they overcame him by the blood of the Lamb, and by the word of their testimony; and they loved not their lives unto the death. Therefore rejoice, you heavens, and you that dwell in them. Woe to the inhabitants of the earth and of the sea! For the devil is come down unto you, having great wrath, because he knows that he has but a short time". The judgment and 'casting out' of Satan is central to the Christian message. Jesus twice referred to it in the gospel of John. God wants all people, Christian and non-Christian alike, to understand what happened to Satan just prior to 70 AD, and the implication of these things for us down here on earth. Now is the judgment of this world: now shall the prince of this world be cast out (of heaven). And when the Holy Spirit is come, He will reprove the world of sin, and of righteousness, and of judgment. Of sin, because they believe not on Me. Of righteousness, because I go to My Father, and you see Me no more. Of judgment, because the prince of this world is judged. Satan has now been cast down to earth, a tremendously angry, bitter and frustrated Archangel. He is like Pharaoh in the book of Exodus. Though he was defeated, Pharaoh chose to pursue Israel into the Red Sea, rather than acknowledge his defeat and let his captives go. Satan also knows that He has lost, but that will not stop him from hardening his heart and deceiving mankind until the very end; plunging headlong into The Lake of Fire. Soon that Lake will close over him, as the Red Sea closed over Pharaoh. Next God explains the persecution of the Jewish people, since the first 'flood' of destruction hit Jerusalem. Satan has been pouring out his fury upon the people who brought his nemesis, the 'Seed of Abraham', into the world. And when the dragon saw that he was cast unto the earth, he persecuted the woman which brought forth the man child. And to the woman were given two wings of a great eagle, that she might fly into the wilderness, into her place, where she is nourished for a time, and times, and half a time, from the face of the serpent. And the serpent cast out of his mouth water as a flood after the woman, that he might cause her to be carried away of the flood. And the earth helped the woman, and the earth opened her mouth, and swallowed up the flood which the dragon cast out of his mouth. And the dragon was angry with the woman, and went to make war with the remnant of her seed, which keep the commandments of God, and have the testimony of Jesus Christ. Repeated waves of persecution have pursued the Jews since 70 AD, but the Jewish 'Diaspora' throughout the earth has caused these floods to fall short of their ultimate aim. Once again we see that God's scattering of the Jewish people has been an act of mercy, preserving them down through the centuries. Now we can understand the spiritual reality behind the scenes of history, and who it was working within men like Hitler to seek the destruction of the Jewish race. Satan is still at work today, seeking to rally mankind against Israel and the Jewish people. These verses also tell us that faithful Christians will be found suffering along with the Jews, rather than persecuting them. This passage describes the second half of the 70th Week in very grim terms. It is the time of Satan's wrath, and is the 'Great Tribulation' spoken of in Revelation 7:14. It is the second half of Daniel's 70th Week, stretching from the destruction of Jerusalem to the second coming of Christ. They that see you (Lucifer) shall narrowly look upon you and consider you, saying "Is this the man that made the earth to tremble, that did shake kingdoms? That made the world as a wilderness and destroyed the cities thereof? That opened not the house of his prisoners?" For those of us living comfortably in America, the idea that we are now in the Great Tribulation seems inappropriate. But it is not a strange concept for much of the rest of the world. Americans life in relative luxury, ease and wealth. Earlier in this vision, the woman was fed in the wilderness for 1260 days. Now, as God describes the same events, she is nourished in the wilderness for 3.5 times. Again, God is showing us that the 70th Week is not a period of 7 literal years. And I stood upon the sand of the sea, and saw a beast rise up out of the sea, having seven heads and ten horns, and upon his horns ten crowns, and upon his heads the name of blasphemy. And the beast which I saw was like unto a leopard, and his feet were as the feet of a bear, and his mouth as the mouth of a lion: and the dragon gave him his power, and his seat, and great authority. And I saw one of his heads as it were wounded to death; and his deadly wound was healed: and all the world wondered after the beast. And they worshipped the dragon which gave power unto the beast: and they worshipped the beast, saying "Who is like unto the beast? who is able to make war with him?" And there was given unto him a mouth speaking great things and blasphemies; and power was given unto him to continue forty and two months. 1) This Beast comes up out of the great 'sea of humanity' and it has ten horns, just like the 4th Beast of Daniel chapter 7. Verse 2 confirms that this Beast is a continuation of Daniel's four Beasts, as we are told that it also has some of the traits of the first three Beasts; of a lion, a bear and a leopard. 2) There are significant differences between this Beast, and Daniel's 4th Beast. This Beast has seven heads. In addition it also has 10 crowns upon its horns. When we look at Revelation 12:3, we see that the Dragon (Satan) also has seven heads and ten horns, the only difference being that Satan has crowns upon his heads instead of upon his horns. Thus, while this Beast is identified with Daniel's four Beasts, it is now very closely identified with Satan as well. In fact, in the passage above, we are told that the Dragon gives the Beast all of his own power and authority. 3) One of the seven heads on the Beast has received a mortal, deadly wound; a wound that was healed. 4) This Beast is very militant; so much so that the rest of the world asks 'who can make war with him?'. At this point I only want to emphasize one thing; God authorized this Beast to continue for 42 months; throughout the second half of Daniel's 70th Week. This is a period of time extending for over 1900 years; from 70 AD until the second coming of Christ. Hence the logical conclusion is that the Beast is not a single person, but some entity capable of continuing over a long period. I have provided an explanation of this Beast in my web page titled Understanding The Beast. In that web page I explain this Beast's origins as the ancient Roman Empire, and the profound change that it went through in 69 A.D. as it became the 'Beast from the Sea' in Revelation. I have also explained its role as the Beast that the Roman Catholic Church rides upon in Revelation 17. And finally I explain how the Beast will wage war directly against the Lord Jesus Christ (Revelation 19:19) after its 10 horns will have destroyed the Roman Catholic world. Beyond my explanation of the Beast, I have also provided a careful explanation of a second Beast, the False Prophet. I explain his deceitfulness, and his use of technology to impose the 'Mark of the Beast' upon the world. I would strongly urge my reader to take a look at this web page about Understanding The Beast. The first part of this web page has been focused on John's Little Book, and its ability to define the final 70th Week of Daniel's 70-Weeks prophecy for us. But now that we understand that 70th Week, we need to come back around and allow this understanding to clarify Daniel 9:27. More specifically, we need to answer this question: Who is the 'He' in Daniel 9:27 who confirms a covenant for a week, brings an end to sacrifices in God's Temple in the middle of that week, and makes the Temple desolate? And He shall confirm the covenant with many for one week. And in the midst of the week He shall cause the sacrifice and the oblation to cease. And for the overspreading of abominations He shall make it desolate, even until the consummation, and that determined shall be poured upon the desolate. The 'He' of Daniel 9:27 is the Lord Jesus Christ, and the key to understanding this fact is to understand what God was saying about confirming a covenant. 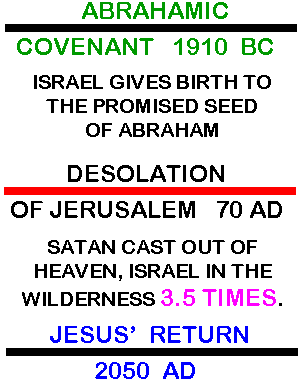 Some have understood Daniel 9:27 to say that someone would make or establish a new covenant, but this is not true. In the original Hebrew version of Daniel 9:27, the word translated 'confirm' expresses the idea of honoring or enforcing a covenant that already exists. God was talking about someone fulfilling a covenant that had already been made. The explanation is simple. When God made His covenant with Abraham it was like an 'I-O-U'. Although God's gracious promise was trustworthy, it existed only on paper; the money had not yet been 'put in the bank' so to speak. The actual work of redemption for sinful mankind had not yet been done. But when the Lord Jesus came into the world and died on the cross, He paid the price to bring God's blessing on all the nations of the world. This is what Jesus meant when He said "It is finished" just before He died. He was saying 'It is paid!' (John 19:30). He confirmed the Abrahamic covenant. Jesus further fulfilled this covenant when He ascended into heaven and presented His own blood before His Father as proof that our sins had been atoned for (Hebrews 9:12,24). This is what Daniel 9:27 is telling us; that it is the Messiah who would confirm a covenant for one Week. Through His death, Jesus confirmed the Abrahamic covenant backward in time to all those, like Abraham, who had looked forward to its fulfillment; and forward in time, to all those who would look back to His finished work upon the Cross. "Behold, I will send my messenger (John the Baptist), and he shall prepare the way before me. And the Lord, whom you seek, shall suddenly come to His temple; even the Messenger of the Covenant, whom you delight in. Behold, He shall come" says the Lord of hosts. Zacharias was filled with the Holy Spirit and prophesied, saying "Blessed be the Lord God of Israel, for He has visited and redeemed His people, and has raised up a horn of salvation for us in the house of his servant David. As He spoke by the mouth of His holy prophets, which have been since the world began: that we should be saved from our enemies, and from the hand of all that hate us. To perform the mercy promised to our fathers, and to remember His holy covenant; the oath which He swore to our father Abraham. You are the children of the prophets, and of the covenant which God made with our fathers, saying unto Abraham "And in your seed shall all the kindreds of the earth be blessed". Unto you first God, having raised up his Son Jesus, sent Him to bless you, in turning away every one of you from his iniquities. Now I say that Jesus Christ was a minister of the circumcision for the truth of God, to confirm the promises made unto the fathers. You are my Son. Today I have begotten You (from the dead). For you will not leave My soul in Hades. Nor will you allow your Holy One to see corruption (bodily decay). Therefore will I divide Him a portion with the great, and He shall divide the spoil with the strong. Because He has poured out His soul unto death, and He was numbered with the transgressors. He bore the sin of many, and made intercession for the transgressors. Not only that, but Daniel already knew through the prophecies that he himself had received from God (in Daniel chapters 2, 7 and 8) that if the Messiah was going to die, He would have to be raised from the dead in order to fulfill those prophecies. 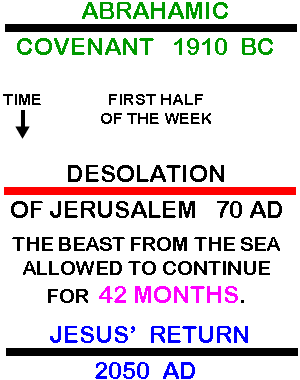 The Messiah's death and His subsequent confirmation of God's covenant with Abraham is the central theme not only of the 70-weeks prophecy, but of the entire Bible. To not first consider the possibility that it is Jesus who confirms a covenant in Daniel 9:27, is to overlook the obvious. And as they were eating, Jesus took bread and blessed it and broke it, and gave it to the disciples. And He said "Take, eat; this is my body". And He took the cup, and gave thanks, and gave it to them saying "Drink all of it. For this is My blood of the New Testament (covenant), which is shed for many for the remission of sins. "Behold, the days are coming" says the Lord, "that I will make a new covenant with the house of Israel, and with the house of Judah. Not according to the covenant that I made with their fathers in the day that I took them by the hand to bring them out of the land of Egypt (the Mosaic Covenant); which covenant they broke, although I was a husband unto them" says the Lord. "But this shall be the covenant that I will make with the house of Israel: After those days" says the Lord, "I will put My law in their inward parts, and write it in their hearts. And I will be their God, and they shall be My people. And they shall teach no more every man his neighbor, and every man his brother, saying 'Know the Lord'. For they shall all know Me, from the least of them unto the greatest of them" says the Lord. "For I will forgive their iniquity, and I will remember their sin no more. In that he says 'a new covenant', he has made the first old. Now that which decays and waxes old is ready to vanish away. The Jewish people hated the idea that the Messiah would bring an end to the sacrifices, even though both Jeremiah and Daniel had foretold it. The approaching destruction of the Temple, and the ending of animal sacrifices, was a major point of contention between the Jews and the Christians. Stephen, the first martyr, was killed for declaring that the Mosaic Covenant would end (Acts 6:14). And Paul was hounded by the Jews because he was accused of disrespecting Moses and the Temple. Jesus accomplished two important things with the destruction of the Temple. First, it demonstrated to the Jews and to the world that He is the Messiah. The fulfillment of His warnings, about the coming destruction of the Temple, confirmed that He had been sent by His Father, and that His words are the words of God. For it is not possible that the blood of bulls and of goats should take away sins. Wherefore when He (Christ) came into the world He said "Sacrifice and offering You desired not, but a body You have prepared for Me. In burnt offerings and sacrifices for sin You have had no pleasure". Then said I (Christ) "Behold, I come (in the volume of the book it is written of Me,) to do Your will, O God". Above when He said "Sacrifice and offering and burnt offerings and offering for sin You desired not, neither had pleasure in them" (which are offered by the law of Moses), then He said "Behold, I come to do Your will, O God". He takes away the first (the sacrifices of Moses), that He may establish the second. If the Temple had not been destroyed, there might still be people ignorantly sacrificing bulls, sheep and goats in Israel today. This would have been truly dishonoring to Moses, because Moses did not want to glorify himself, but the promised Messiah and His salvation. The destruction of the Temple has revealed the Mosaic covenant for what it really was, and still is to this day; a schoolmaster to point us to Christ as the ultimate Lamb of God (Galatians 3:24-25). 1) And after threescore and two (62) weeks shall Messiah be cut off (be put to death), but not for himself. 2) And the people of the prince that shall come shall destroy the city and the sanctuary. 3) And the end thereof shall be with a flood, and unto the end of the war desolations are determined. 1) And He (Messiah) shall confirm the covenant with many for one week. 2) And in the midst of the week He shall cause the sacrifice and the offerings to cease. 3) And for the overspreading of abominations He shall make it desolate, even until the consummation. And that determined shall be poured upon the desolate. We know that the people who destroyed Jerusalem and the Temple were the Romans. But who is the "prince that shall come" mentioned in Daniel 9:26? It is the Roman General Titus, the man who led the armies of Rome in the destruction of Jerusalem. God makes mention of this 'prince' because it is important for us to understand his unique role in history. The people of Israel rebelled against Roman rule in 66 AD, and a Roman General named Vespasian was sent to crush this rebellion. As Vespasian began to conquer Israel and close in on Jerusalem, civil war broke out back at home in Rome. Late in 68 AD the emperor Nero committed suicide, and he was legitimately succeeded by a man named Galba. But Galba only lasted in office for a short time before he was murdered by a Roman general (Otho) who was seeking the emperorship for himself. And so the Roman Civil War began. Vespasian had to halt his advances against the Jews until he could be certain about the future of his own nation. Ultimately Vespasian's allies and armies convinced him that he should return to Rome and become the next emperor, which he did. And when he left Israel, Vespasian put his son, Titus, in charge of the Roman armies there. So when Vespasian became the new Emperor, Titus became a prince of Rome, and ultimately went on to become the next emperor after his father. 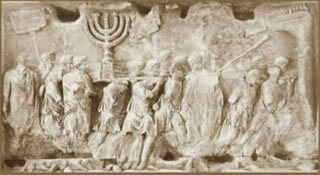 Many of the Jewish people probably thought that the Roman Civil War signaled God's deliverance of their nation. But in reality it was the worst thing that could have happened to them, for two reasons. First of all, once Rome got back on its feet it became necessary for it to demonstrate to the entire world that the Empire was just as much to be feared and obeyed as ever before. The Jews became the practical demonstration of this fact. Secondly, both Vespasian and Titus had a personal interest in making sure that their victory over the Jews was impressive, because they needed to demonstrate to the Empire that their family deserved to become the next ruling dynasty of the Rome. And so, as Daniel 9:26 tells us, the destruction of Jerusalem happened as though a flood had hit it. The historian Flavius Josephus tells us that upwards of a million Jews died in the siege of Jerusalem, and as many as one hundred thousand more were taken captive and sold as slaves throughout the Roman world. 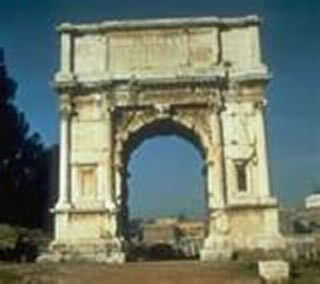 To this day there is an ancient structure standing in Rome, called the Arch of Titus, which depicts (in its carvings) the victorious Roman soldiers carrying away the furniture of the Temple. In Daniel 9:26 God is presenting us with the story of two princes. One is the prince of Israel; Jesus, the Son of David. The other is the prince of Rome; Titus, the son of Vespasian. The prince of Israel came to His own nation and was put to death by the Jews and the Romans, and received nothing of the glorious kingdom that had been foretold for Him. By contrast, the prince of Rome rose to supremacy over Israel, crushing its people, its capital city and its Temple, while his people would go on to dominate the Jews for the next 1800+ years. It is the coming of these two princes to Israel, and Titus' desolation of Jerusalem and its Temple, that marks the midpoint of Daniel's 70th Week; the great week of the Abrahamic Covenant. It was a midpoint initiating great suffering for the Jews, and great tribulation for a world that would now lie under the bitter rage of a defeated archangel. But when Jesus returns, the fortunes of these two princes will be reversed. The princes of Rome and of the world will be crushed and destroyed forever, Satan will be chained for 1000 years, and the Prince of Israel will establish a kingdom that shall never end. This is meaning of the two princes. Oh, the depth of the riches both of the wisdom and knowledge of God! How unsearchable are His judgments and His ways past finding out! For who has known the mind of the Lord? Or who has become His counselor? Or who has first given to Him, and it shall be repaid to him. For of Him and through Him and to Him are all things, to Whom be glory forever. Amen.